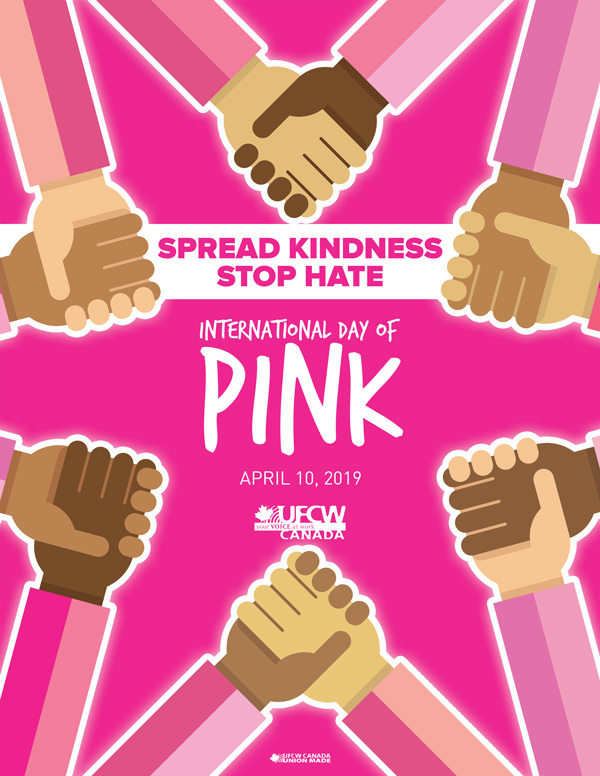 The International Day of Pink started in Nova Scotia in 2007, when two high school students stood up for another student who was being bullied for wearing a pink shirt at school. The next day, the students led a show of solidarity where every student came to school wearing a pink shirt, effectively taking a stand against bullying and discrimination. As Canada’s leading union, UFCW knows that bullying at work often takes the form of discrimination, whether it be through favouritism, workplace reprisals, inappropriate jokes, or the breach of a person’s human rights. We also know that bullies respond to strength, and there is nothing stronger than the power of workers standing together to say “NO!” to bullying and discrimination at work. Belonging to a union is about more than just higher wages and having a voice in the workplace. It is also about standing up for others when their rights are being violated. Your union contract can help guard against this through anti-discrimination and anti-harassment language. As well, unions provide access to activism and educational opportunities that seek to raise awareness of the need for safe, inclusive, and harassment-free work environments. Belonging to a union also bestows a responsibility on each of us to promote diversity in the workplace, speak out against intolerance, and stand up to bullying wherever and whenever it occurs. Indeed, taking a stand for others is just as important at work as it is in our schools and communities. On this International Day of Pink, I encourage you to challenge all forms of bullying with love, awareness, and education. Because when we take collective action against bullying and discrimination, we create a better world for everyone.